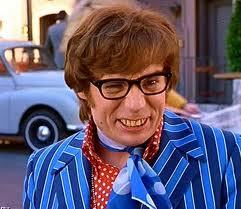 Mike Myers is returning for a fourth installment of Austin Powers. The dog days of August are upon us, as well as the closing weeks of the summer movie season, but there are still plenty of Hollywood casting news both silly and serious to fill this week’s “Get Me Ron Perlman” column, the only casting news column named after character actor par excellence Ron Perlman. Wondering what Mike Myers will do now that the Shrek franchise is over? According to a not-so-surprising report at HitFix, Myers is dusting off his popular character, the swinging sixties British spy Austin Powers, for a fourth installment of the popular James Bond spoof. With Myers committed to the movie, Jay Roach, director of the Austin Powers movies, is also set to return to the series. Actress Mireille Enos, nominated for an Emmy for her role as Detective Sarah Linden on the AMC crime drama The Killing, continues her career ascent via a supporting role on the Warner Bros. period crime drama Gangster Squad. Enos joins an impressive cast, including Ryan Gosling as a LAPD cop who’s battling mobster Mickey Cohen, played by Sean Penn, in ‘40s Los Angeles. According to The Hollywood Reporter, Gangster Squad is the latest high-profile studio for Enos who also stars opposite Brad Pitt in the zombie thriller World War Z.
British actress Sienna Miller shows an impressive commitment to world-class filmmakers by joining the first English-language film from French-Algerian director Rachid Bouchareb, who built a small but loyal following of art-house moviegoers for his Foreign-language dramas Days of Glory, about North African men enlisting in the French army during World War II, and Outside the Law, about the Algerian struggle for independence after World War II. Miller joins actress Golshifteh Farahani in Bouchareb’s drama Just Like a Woman, about two women from different backgrounds who go on a journey of self-discovery together. The biggest burst of movie nostalgia belongs to choreographer and director Kenny Ortega agreeing to direct a remake of the beloved 1987 romance Dirty Dancing starring Patrick Swayze and Jennifer Grey. Since Ortega worked as a choreographer on the 1987 original, he’s a solid choice to make a new version of Dirty Dancing. This week’s silliest casting news, a choice that’s always difficult to make, goes to Peter and Bobby Farrelly signing the entire cast of the MTV reality show Jersey Shore to make a cameo in their upcoming Three Stooges movie starring Chris Diamantopoulos as Moe, Will Sasso as Curly and Sean Hayes as Larry. Then again, a new take on the Stooges is meant to be silly so maybe bringing Snooki, JWOWW, Sammi and the rest of the Jersey Shore gang is brilliant casting.